The Dublin social centre, Seomra Spraoi, will be homeless again from May 23rd. The social centre has been located on Lower Ormond Quay since August 2006, but is currently seeking a new home, as the owner of the building is planning to sell up. The collective that set up and runs the centre â€” also called Seomra Spraoi â€” is calling on all the people and groups who have used the space to help keep the project going. A public meeting on Thursday (May 3rd) at 8pm will include a slide show and short talk about social centres and the history of Seomra Spraoi and an open discussion about how you can get involved at this critical stage. It’s not too late to organise an event. In fact, the collective is trying to put on as many events as possible in its final weeks at Ormond Quay. See contact details below. Seomra Spraoi expects to have to pay a bigger rent on whatever space it moves into next. You can help by taking out a standing order (see below) or organising a benefit gig or making a donation at the Seomra. Groups who have used the space and hope to use the next space are encouraged to make a regular donation of whatever they can afford, preferably by standing order. Watch out for more background about the project soon on Indymedia. Look out for spaces to rent in Dublin city centre. Let Seomra Spraoi know if you have storage space. Come to our public meeting on Thursday, May 3rd, at 8pm at 6 Lower Ormond Quay. Come to our regular meetings every Thursday at 7.30pm (not this week). Take out a standing order (to be posted here in a minute). Dublin is on the verge of having an autonomous social centre, set up and run by a collective called Seomra Spraoi, which formed last year. A public meeting this Saturday will update on progress and take on board people’s views on what the centre can be used for and how it will be run. It’s not too late for you as a individual or group to become part of the project (indeed it will never be too late to come on board, but now is when you are needed). Seomra Spraoi is a collective seeking to establish an autonomous social centre in Dublin. Lots of individuals and groups are on board. There is a credit union account with money in it. Fundraisers have been happening. Folks have been meeting weekly for quite some time. For more background see the link below. Now, keep the following under your hat: as things stand, we should be making a definite announcement on Saturday about a space in the north inner city which will be taken up in early August! By the way, â€œpublic meetingâ€ does not mean you coming along to listen to the heads who are involved already: it’s about everyone who comes along sitting around in a circle and making decisions together. 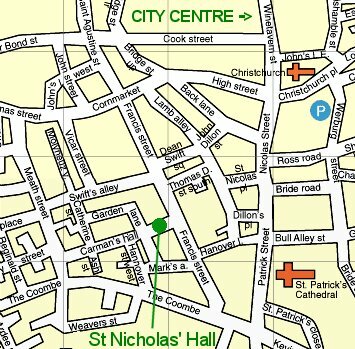 Nicholas of Myra Hall is on the corner of Francis Street and a small street called Carman’s Hall. Coming from Thomas Street, about two thirds the way along, you’ll see a grand piano hanging off a building on the left: turn right there and it’s on the right. There will be a half hour break from 3:30pm to 4pm, followed by a report back meeting from the G8 summit in Scotland. Bring some food to share (Seomra Spraoi will not be cooking this time). If the weather is still fine, we can have the meeting in the playground outside. This Friday, the 28th, starting at 8pm, St. Nicholas of Myra Parish Hall, Carman’s Hall. 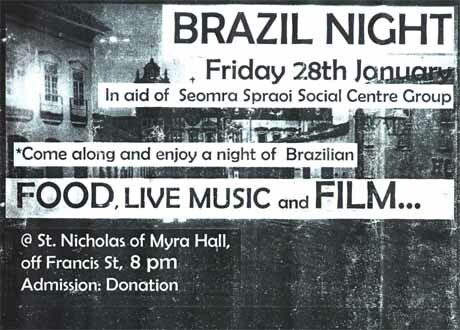 There will be a film followed by live Brazilian music and food. The venue is the St. Nicholas of Myra Parish Hall, Carman’s Hall (a street running between Francis Street and Meath Street). Admission free or donation. For more information contact 0872861238. All welcome. Film: Raw-Farming: Documentary on Brazilian women’s organic farming movement (courtesy of LASC, details here). Today in Ireland there is virtually nowhere indoors for people to congregate that isn’t a pub or overpriced cafÃ©. Many readers will be aware of the success of autonomous social centres in other European cities, independent of local authority, church, business or other controlling body. These spaces have provided a focal point for many of the social movements in the West, where public spaces have been eaten away by consumerism, property speculation and the culture of the car. They celebrate collective cooperation and diversity and have numerous day-to-day uses: community drop-in centre, inexpensive cafe, political meeting space, library, gig venue, arts centre, and internet cafe, to name a few. Several attempts were made in Dublin in the past couple of years to set up autonomous centres in buildings that had been derelict for years, but these have been evicted by the City Council or by â€œheaviesâ€ employed by the owners. Clearly the Council would prefer to see buildings remain derelict rather than put to any use. Seomra Spraoi is the provisional name of a collective which has come together to create a social centre space in Dublin. In early December there was huge response to the call for a gathering to initiate an Autonomous Social Centre in Dublin over a hundred people came and watched films about centres across Europe and chatted over vegetarian food served afterwards, then on the 21st of December we had a well attended gig in the Voodoo Lounge, where fans of both punk and dance were entertained and more funds were raised, how long before we can use/raise that money towards a building is the question. After the Xmas break we had another meeting in the first week of January to see how far we got with research on the finance and structure of the proposed social centre. We have expanded on our wishlist of functions for the centre and now we have to start making these a reality under one roof. As we organise we coming across the very factors which have made it necessary to take this ambitious project on, small borrowed rooms, restrictions on their use, no consistent place for people to know where we are. We have been talking to people involved in social centres and how they go about it and making contacts with them and remembering our own experiences on our travels to spaces around Europe and elsewhere. We are still refining the question of what do we want and how do we make it happen within the restriction of doing it the legal way, (Insurance, finance, legal form etc.). Next we will be concentrating on the search for a location, raising more money and getting more people involved. We are looking for more people or groups who think they could help with the project in any way or possible co-host events of the type that one day may be held in the centre. To get in contact us mail gimme_space@yahoogroups.com or subscribe to the mailing list at http://groups.yahoo.com/group/gimme_space. Always when people start their own activities they start with the things they really need. Sometimes a place to come together sometimes it’s a place for their kids sometimes it’s a place for practising with bands but I think people mostly make what they need. That’s also the positive thing of squatting a space you don’t have to wait for someone else to tell you what it can be â€” you can project your own ideas. I don’t think it’s our role as â€˜activist communitiesâ€™ to provide social space (or other services) to â€˜wider societyâ€™. That’s not to say that our actions & spaces cannot have an impact outside of our own political & social circles. I think people are beginning to see the need for creating our own informal places were we can meet or where people can be attracted who aren’t directly in our social circles. It’s like a form of outreach about anarchist politics, community organising, & environmental politics. Without this kind of space people often donâ€™t get to know about that stuff & we’re not very good a lot of the time of communicating. So this is a nice way of getting to know new people. I think a problematic assumption in Ireland is that people setting up a social space owe â€˜youâ€™ something. For instance â€˜youâ€™ may believe the Magpie squat in Dublin â€˜did little to advance squatting/political ideologyâ€™, but I don’t remember them making any announcements or promises saying they would. (Anyway I disagree with this assessment I know at least 2 squats in Belfast & many more around the country that were pretty much directly inspired by the Magpie House). Even in countries with long term squatted social spaces; 9 times out of ten a new squat is a short (albeit passionate) affair. People keep opening more & learn from every experience, & occasionally they last a long time. I thought Disco Disco was a very successful action even though we only had the squat for 25 hours. Everyone went through the process of gathering the information which I might add was 10 times harder than doing any squatting action here as here there’s 35 years of history behind us. I think that’s the only difference between squatting here & squatting in Ireland is 35 years. Once the crew there get going there’ll be no stopping them now they have the experience & knowledge. I don’t think we need to get too embroiled in debate over we should be making legal or squatted spaces, they are certainly not mutually exclusive (& it’s not as though we’d only wanna see one social centre in Dublin). For instance in Amsterdam legalised spaces hold â€˜squatting info hoursâ€™ where people can come along & get info & advice & practical help with squatting. Giros/Warzone Centre was a rented space that existed in Belfast for 18 years, which essentially managed to pull off a lot of cool stuff, & spending 5 years of my life (hey & I’m not jaded!) organising activities there I never found the legal aspects of the place very constraining. In the end Giro’s closed because we didn’t feel like doing it anymore. (â€˜The Manâ€™ never bothered us much). I don’t think it comes down to whether it’s a squat or a legal space. The things that are important are the people involved & what they do. If we’re doing good stuff it doesn’t matter that we’re legal even if we’re working within the system we’re still doing good stuff. It’s important to have a good group to be sure that people are really involved to have good interaction with the local people that’s very important it’s a social place it’s the kind of place to build the social links we’ve lost in the society. International networking can be useful to share experience & share knowledge. As far as meetings go if you try to use facilitators use structured meetings just so when emotions run high there’s a way to deal with it. Because it’s quite common when pressure mounts these group decision-making processes become very dysfunctional. So it’s good to have a facilitator who can steer a group towards decisions rather than fall apart in quarrels & arguments. I think that’s one of the most important things about working with other people in a non-hierarchical setting. If you’re gonna embark on the crazy adventure that is setting up a social centre you mustn’t underestimate how much work it is. We never realised how much work it would be to get the building up & running some people said if they realised how much work it was they might not have done it & they were at the very limit of their capacity. You need to have a crew of people who are not just excited about it but also have the time & energy to dedicate to the place. If people are interested in doing it don’t exclude them the more people squatting the better. Be inclusive. Don’t be afraid to do it take risks. Nothing is achieved without taking risks. After the first couple of squats are established go public start organising things have info-cafÃ©s on site. Only squat things owned by the government. Just squat things everywhere, not to be centralised it’s easy for people to think outside Dublin there’s nothing â€” just bog. But people in Cork are ready to go for it. Go squatting in the countryside all these people that have gone to America or have died & left behind farms reclaim the streets reclaim the city. Just keep going. There will be a meeting tomorrow evening, Thursday 9th of December 2004 in the Ecological and Environmental Non Governmental Organisations (EENGO) office, 10a Camden Street at 7pm. This office is located upstairs above a shop called Bounty Stores. Just buzz on the button that says EENGO. The purpose of the meeting is to further discuss the possibilities of starting a social centre in Dublin city. To date there have been a number of meetings and there was a video screening on the issue held last Friday, December the 3rd. There are lots of people interested in getting involved. There are lots of ideas and there is a desperate need for this type of centre. Now what is needed is that we organise, plan and realise the dream! !